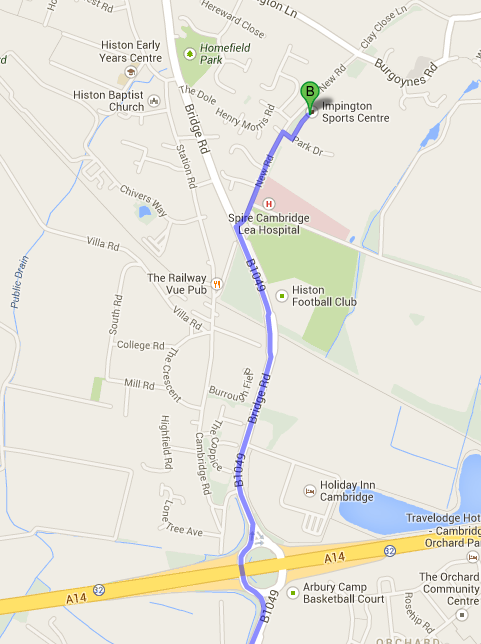 From the A14, head north towards Histon/Impington and take the first right after you’ve been over the hill. This is New Road. Head along New Road, passing the BUPA Hospital on your right and a Police Station on your left. The sports centre entrance is on the right and is marked by an opening in a high brick wall next to a gatehouse cottage. Go through this entrance and head left into the car park – the pool is just beyond the car park.